Ruth Nugent above, Top Ruth’s Fiesta in Mondello Park. Pic by Chloe Kellett Photography. I dropped off the grid here for a while but I’m back with so much news I don’t know where to begin! Rounds 9 and 10 of the Fiesta Zetec Championship were held at the annual Formula Vee Festival in Mondello Park. As we were competing on the national circuit I didn’t feel the need for any testing as well as I unfortunately didn’t have the time due to work commitments. The Saturday of the race weekend ended up being a very unpredictable day. Within the first two laps of qualifying I had to retire as the car was misfiring and not going anywhere. We spent the next short while trying to find out what exactly was causing it and seeing as it was nothing obvious and we couldn’t test the car in the mean time we just had to hope for the best for race one. Starting at the back of the grid for race one, I managed to gain three positions until on the third lap, the car lost power and I decided it wasn’t worth continuing as I wouldn’t gain any championship points from finishing last so I retired once again. This was my first DNF and I was disheartened knowing that I couldn’t finish the race with the car having no power. Seeing as we couldn’t figure out what was causing the loss of power I had to consider other options. With the help of a few friends from around the paddock (Kevin Gillespie and Mark Meenehan), I managed to organise collecting another car during lunch time and got it through scrutiny in time for the next race however, with such little time to prepare I failed to realise that I couldn’t reach the gear stick nor any of the pedals due to the height difference of the previous driver. With a few pillows shoved behind me I went out and hoped for the best and finished the race with a fair bit of difficulty and entertainment! Thanks to Denis Mc Crudden and Chris Nugent we got the seat moved to the correct fitting ready for race three the following day. With the last minute change in the timetable, I was left with the whole of Sunday to spare until race three at 4pm in the evening so I decided to head back to my comfort zone – out on the banks. I was positioned at the hole in the hedge (entrance to turn 4) which I was happy with as I was having trouble with this corner the previous day in the car so I was able to spectate and see how other drivers were approaching it. It was refreshing to get out on the banks for a few hours and it built up the anticipation and excitement for my final race. I felt a lot more comfortable in the car now that the seat was adjusted and starting from the back of the grid again I decided to not put pressure on myself and just go out with the aim of getting whatever championship points I could. I finished P15 and these points have now left me 10th in the championship ahead of the final weekends racing in September. Unfortunately due to some unforeseen circumstances, I will not be finishing the season in my signature orange Fiesta Zetec. I will however, be out racing in the Leinster Trophy meeting but in another feisty Fiesta which I will report back on in the next blog. Watch this space! Seeing as my next championship race weekend was nearly two months away that left me free to marshal wherever I can and with the recent good weather, it’s all I want to do seeing as I can’t race! In July, myself and my Dad marshalled at the most recent round of rallycross in Mondello and as Dad had one arm in a cast, he was only flagging duty and I was on ground work. It was a busy enough day with a few cars off but most of all it was so great to meet some of the familiar rallycross heads, some of which have known me since my very first event. Nothing really beats a good day of rallycross! And there was plenty to see with the juniors out in force and Derek Tohill putting on an awesome display as per usual. Next up for us was the two weekends of the Dunlop Masters in Mondello Park in August. On the Saturday of the first weekend after a long day marshalling we (Motorcycle Marshals Association) attended an organised “First On Scene” training course. This course was ran with the intention of setting out guidelines of what a marshal is to expect when they are first on the scene of an accident. Some of our marshals have been unfortunate to have witnessed some fatalities this year and this highlighted the fact that we can all never be too prepared for being the first on scene. After a disappointing previous race weekend in my own championship, I was slowly forcing myself to become positive again and get prepared for the Leinster Trophy when an unexpected offer came my way and instantly made me forget about my Fiesta woes! The MicksGarage.ie Future Classics class invited me to join their grid at the Historic Racing Festival on the 19th of August. Of course I jumped at the opportunity. I was fitted to drive Mike Dermodys legendary Fiat Punto in a grid of 32 cars and was ready for the new challenge ahead of me. In testing the day before the races, I learned very quickly that I had a lot to get used to in this unfamiliar car by ending up in the gravel trap twice! I was getting frustrated at myself instead of just letting myself relax and get the feel of the car. I had to get myself to wind down and keep at it. In the middle of testing Tommy Byrnes mechanics who had joined us in the marshals camp site the night before asked to borrow a balaclava as he had forgotten his. I volunteered mine not thinking much of it until I told my Dad who demanded I was not to take it back until it was signed! I went to retrieve it at the end of the day and had the pleasure of chatting to the Crash and Burn star himself. Luckily, Mike sat me down the night before the race day and told me to stop being hard on myself and most of all to just go out and enjoy myself so he could see the biggest smile on my face when I’m done. So the next day, I woke up to a very wet track and some nerves eating away at me. We went out in practice on a wet track which ended up covered in oil also. A few of us were all over the place but I secured us a red flag by going a bit cross country (as you can see in this new famous photo by James Foley!) at turn 3 and needing to be towed in. Luckily there was no damage done to the car and we were ready to go for race one. As there was no qualifying session and we weren’t being timed, our grid positions were chosen by names being taken out of a hat. I was somewhere right in the middle of all the chaos with some very well established and talented drivers behind me so I had no other choice but to tell myself to relax and just enjoy it! Race one went swimmingly as some would say. I must have gotten all the mistakes out of my system in testing and practice because nothing went wrong and I managed to keep a good few cars behind me as well as achieve some over taking! I was beaming getting out of the car in scrutiny bay after the race. Race two was a reverse grid so I was down at the very back. It was incredible to see a sea of cars in front of me barrelling into turn one! That was probably one of my favourite memories from the weekend. I enjoyed race two and gained a few positions throughout the race and was cheered on by all the marshals on the banks throughout the day. The Future Classics class have always been hugely respectful towards marshals and have always expressed how grateful they are for all we do in motorsport so it was an honour to have raced alongside such kind, talented drivers. They’re the only championship class I know to work together and mutually support one another and it really was so refreshing to be a part of. A huge thank you to Richard Kearney, Mike Dermody and everyone else for the invitation and for a fantastic experience. I enjoyed meeting so many new faces who all had wonderful things to say to me about our marshals and to me personally as a driver. I loved every single minute of the weekend to say the very least! And finally, I’d like to just say a huge congratulations to Emma Dempsey and Nicci Daly from the new all-female motorsport team Formula Female on their very successfully debut and for raising an incredible near €7,000 for the Irish Cancer Society. They each drove sensationally and really turned heads with their success on their first race weekend. It was a pleasure to be racing on the same grid as them along with the rest of the talented drivers in the Future Classics class. I’m very proud to announce that I have recently been asked to join the Formula Female team alongside Nicci Daly and Emma Dempsey for next years racing season! After racing in the same class as them at the Historic Racing Festival and getting to meet them officially, I was shocked and delighted to later be asked to join them next year out on track. 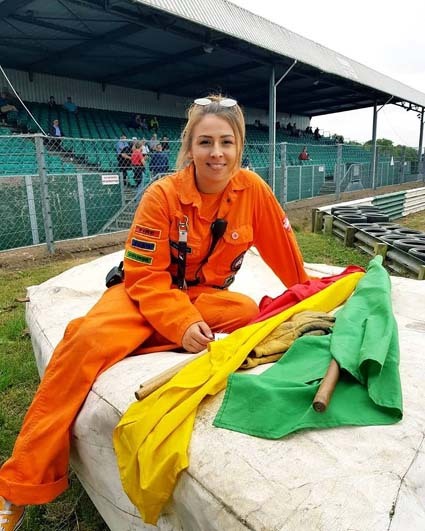 We aim to work together to influence females into motorsport and to support and encourage females of all ages who are already involved in the sport. I can’t even begin to describe how proud I am to be a part of the Formula Female team and hopefully I can reveal more good news in the near future. Until the next time check out my previous posts here.